My journey began in Addis Ababa, Ethiopia, in the midst of a revolution that overthrew a 2,000-year-old monarchy and eventually led many of us into an exodus of uncertainty. My mother was 17 when she had me, and she was passionate about music and the arts, a rarity in an Ethiopian society deeply embedded in tradition. I spent most of my life in transition, an immigrant who never belonged to a place, never quite fitting into my surroundings. We moved often — Yemen, England, Cyprus and Canada — the one consistent element being my mother’s pride in Ethiopia. My nomadic life was shaped by her stories about our homeland and her childhood. I am the daughter of a dreamer who always sought to give me a better, richer life experience. One of those experiences was first encountering photography while in high school in Calgary, Alberta. When my art teacher lent me his Pentax 35-millimeter camera, it became a portal into a new world. My fascination with the power of images would eventually lead to my working as a photojournalist for various publications, including The Washington Post, but over time I began questioning depictions of Africans and African Americans in the mass media. It dawned on me how the supposedly neutral form of photography was a tool that had helped perpetuate stereotypical images of black people globally and erased a complex past and future. Increasingly, I was finding traditional forms of artistic expression — in music or visual arts — more exciting and innovative than contemporary art pieces. As I explored these areas myself, traditions of face painting, not only in Africa but globally, inspired me. I was struck by the stylistic commonalities in face painting throughout all cultures, and that got me thinking about the masks we all use in our daily lives. 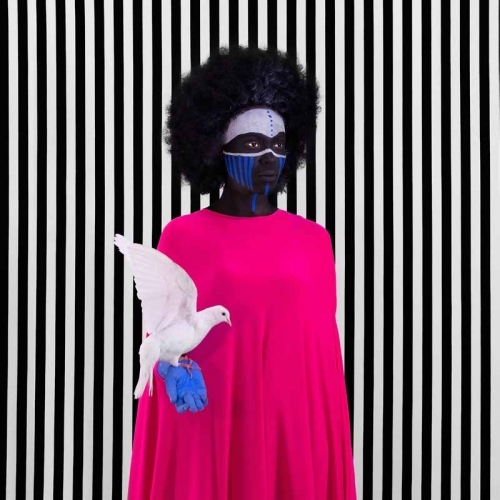 My use of masks and colors, in which I mix styles from various Ethiopian tribes and face-painting designs worldwide, is not simply an aesthetic choice; it’s meant to simultaneously attract viewers while destabilizing their automatic categorization of the subject in question — a “portrait of a black woman,” for example. People have asked me if I am intentionally whitewashing the models as a political statement, but my hope is that the initial dissonance viewers feel will give way to probing the work further and considering the universality of struggles worldwide. The masking in my photographs is, in a sense, my attempt to uncover other masks and consider underlying truths.